Last night we had our second to last holiday party of the 2016 season. When did these things start rolling into the new year? 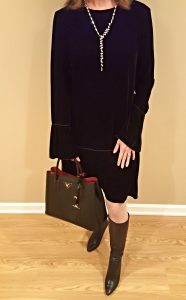 I wore an outfit that I received from my mother-in-law this Christmas. 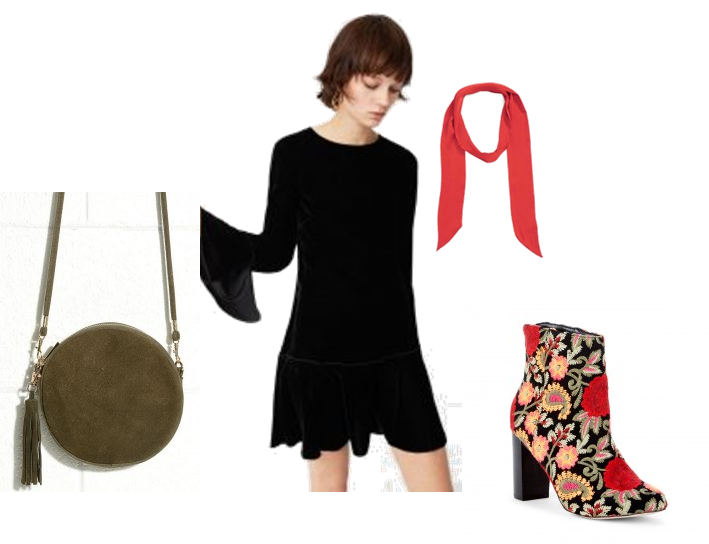 She got me the Mango Velvet Dress featured in this post and I thought it could be fun to show how I re-styled it for this event. The dress code was business/cocktail (confusing, right?) so for a look that was much less boho than the original, I paired the dress with a crystal Y-necklace (LOVE! – also gift from mother-in-law), crystal earrings and a heeled stretch leather black boot. You look soo cute! Hope you felt as good as you look in the outfit! Glad it worked out and I love that necklace with it! Thank you! Felt great wearing it & think the necklace will go with so many things!